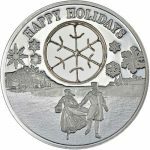 There are countless examples of popular silver coin programs available today from mints around the globe. 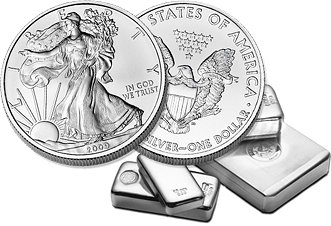 Among the most popular with collectors are silver proof coins. 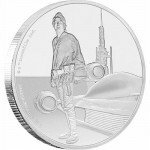 While it comes as no surprise that nations like the United States, Canada, Australia, and several countries across Europe have robust sovereign minting operations or support sovereign bullion coining with the help of private facilities, some of the smallest nations on the planet also have a surprisingly robust bullion coin collection. One of the nations with the largest profile of gold and silver coins is the nation of Niue. This small South Pacific nation has an outsized profile on the global precious metals stage, with countless coin programs struck and released in its name. Among the collection of Silver Niue Coins you’ll find some stunning offerings, all of which are available in a variety of sizes that make them attractive to and affordable for any investor. 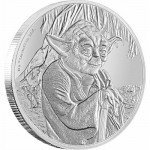 Below you’ll find a vast array of Silver Niue Coins from the Silver.com catalog. Frozen was unquestionably one of the most triumphant Disney films of the 21st century, capturing the hearts of little girls around the globe with the enthralling tale of two sisters who are close as kids, grow apart with age, but never lose their unbreakable bond of sisterhood. Frozen – Magic of the Northern Lights is a five-coin series from the New Zealand Mint struck for Niue that includes colorized finishes on the reverse face and a common obverse design. Arrives encapsulated in plastic inside of a themed storybook case. Queen Elsa: The reverse of the 2016 1 oz Silver Niue Disney Princess Elsa Coin features another queen with a little more magic in her bag of tricks. Queen Elsa is captured with the brilliant, colorized Northern Lights in the sky behind her, with her blue dress and long, snow-white hair all captured in real-life hues. 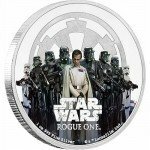 Princess Anna: On the reverse of the 2016 1 oz Silver Niue Disney Princess Anna Coin is the colorized image of Anna, wearing her familiar clothing from the film with full color. The background of the top half of the coin’s reverse features the beautiful, full-color appearance of the Northern Lights. 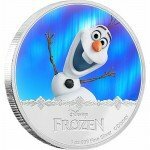 Olaf: On the reverse of the 2016 1 oz Silver Niue Disney Frozen Olaf Coin you’ll find the image of the happy, laughable snowman Olaf from Frozen. Olaf is captured in brilliant color, and the background shows flashes of the Northern Lights, with the bottom third of the coin maintaining its silver finish. 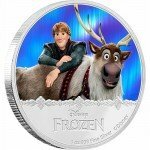 Kristoff and Sven: On the reverse of each Silver Kristoff and Sven coin you’ll find the colorized image of Kristoff as he leans up against his friend, Sven the reindeer. The duo are highlighted in the background by the Northern Lights flashing in skies above the kingdom of Arendelle. 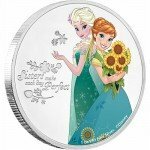 Anna and Elsa: The reverse of the 2016 1 oz Silver Niue Disney Frozen Princesses Elsa and Anna Coin you’ll find the two sisters, captured in brilliant, full colorization. The background field of the top half of the coin is similar to all four previous releases in the series, with the northern lights illuminating the skies over the kingdom of Arendelle. There is an exciting new series of coins in 2016 for the nation of Niue known as Kings of the Continents. With a new design on each release, this series takes you around the globe to look at the many animals that dominate the landscape of the world’s landmasses. The Kings of the Continents Series from the New Zealand Mint includes colorized images on the reverse side of each coin, bringing the featured animal to life with brilliant hues. Each coin here is in Brilliant Uncirculated condition. BU coins feature no signs of wear and tear, though you may notice breaks in the luster, spotted surfaces, or contact marks. Ships to you in a capsule within a Kings of the Continents-themed box, complete with a Certificate of Authenticity. 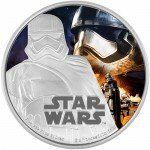 Consists of One Troy oz of .999 fine silver. 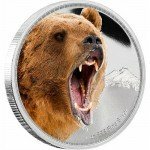 Grizzly Bear Coin: The grizzly bear is the largest mammalian predator in the world today, and is technically known as a subspecies of the North American brown bear. These massive predators stand as tall as 8 feet in height and can weigh upwards of 800 lbs. The official name of the grizzly bear is Urusus horribilis, which literally translates as “terrifying bear.” On the reverse of each 2016 1 oz Niue Silver Kings of the Continent coin you’ll find the startling image of a grizzly bear letting out its powerful, fearsome roar. 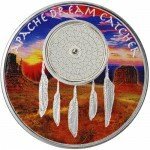 Only the image of the grizzly bear has been colorized to help it stand out from the rest of the coin’s design. King Cobra Coin: King Cobras are so-named because of a set of 11 scales on the back of their heads. These 11 scales form a figure that looks a lot like a crown, hence the name King Cobra. The fearsome snakes can grow up to 24 feet in length, and typically inhabit the jungles of Asia and India, stretching from southeastern China across the Malay Peninsula and into the Philippine Islands. 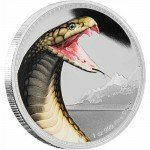 On the reverse of the 2016 1 oz Niue Silver Kings of the Continents King Cobra coin is the image of one of these fearsome creatures with its head reared up and ready to strike. The image of the snake alone is colorized on this coin. 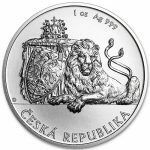 African Lion Coin: The African Lion is known as the King of the Jungle, but its range on the African continent doesn’t actually contain any jungles. One of two subspecies of lion in the world, the African lion primarily inhabits grasslands, savannas, and other scrublands throughout the southern Sahara Desert, eastern, and southern Africa. The reverse of all 2016 1 oz Niue Silver Kings of the Continents African Lion coins features the image of a massive male lion. The hairs of the beast’s mane are standing on end, and his powerful jaw is open wide as he lets loose a fearsome roar. 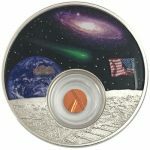 The New Zealand Mint was a bit late to the game in launching lunar-themed collection, but it succeeded with the 2015 introduction of its own Lunar Coin series in both silver and gold bullion. 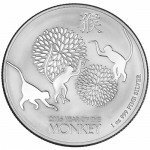 Currently these coins are available in the 2015 Year of the Goat design and a 2016 Year of the Monkey. Silver Niue Coins in the Lunar Series collection all feature the same obverse design, which includes the right-profile portrait of Queen Elizabeth II, a well-known design from Ian Rank-Broadley. Her Majesty’s profile is beautifully detailed from her curled hair to the contours of her face. 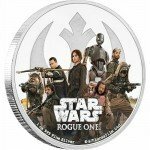 Around the outer rim, the reverse features the inscriptions: “ELIZABETH II, NIUE, and TWO DOLLARS,” as well as the year of issue for each release. 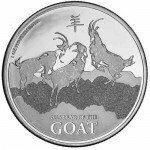 2015 1 oz Silver Niue Year of the Goat: The reverse side of the Year of the Goat coin features a group of three goats clashing at the top of a stylistic rocky outcrop. The design features a mirrored finish in the background, with one stretch of mountaintop finished in frosted relief. Engravings on the reverse include the Chinese symbol for goat in the center, the weight, purity, and metal content along the left, and the phrase “2015 Year of the Goat” below. The silver version of the Silver Niue Coins in the Lunar Series collection feature .999 metal fineness. 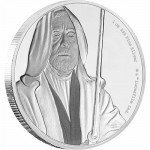 The silver coin’s face value is set at $2 (Niue). 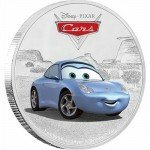 Silver Niue Coins are available in a variety of Disney-themed design ranges. 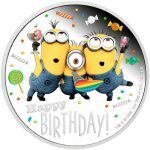 For example, the New Zealand Mint has a portfolio of options ranging from the Disney Princesses collection to the Disney Classics collection. 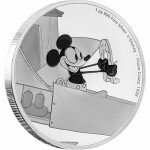 The latter of these two collections features an exciting coin set that any serious Mickey Mouse fan has to own. 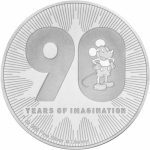 The Disney Classics collection contains a sub-category of coins known as Mickey Through the Ages, which follows the evolution of Mickey Mouse throughout the course of nearly 90 years of feature films and animated shorts. Moana: These coins have a limited mintage of only 10,000 coins and come in a storybook-themed box. In the newest Disney film to be released, the franchise travels to the Oceania region of the world to follow the epic journey of Moana and Maui. In the film, Moana sets out on a journey across the Pacific Ocean to prove to her people that she’s a master wayfinder just like her ancestors. She encounters the demi-god Maui during her travels, and together they face the open ocean in a voyage that sees them cross paths with fiery creatures and the potential for harm. The reverse of the 2017 1 oz Niue Silver Disney Moana coin includes the colorized image of Moana and Maui as they sail across the Pacific on their ancient craft. The scenes depicted come straight from the film and includes colorization to bring the coin’s design and imagery to life for the viewer. 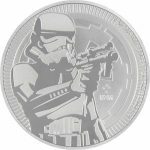 One of the most exciting collections available right now among Silver Niue Coins are those from the Star Wars collection. 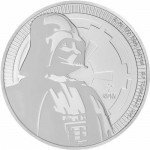 Currently, the New Zealand Mint offers two different series under the Star Wars umbrella. Fans young and old crammed theaters at the end of 2015 to see the release of the first film in the highly-anticipated new Star Wars trilogy. 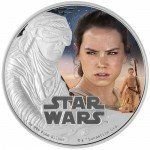 Set in the future beyond the timeline of the original three Star Wars films from the 1970s and 1980s, the release of Star Wars: The Force Awakens dominated global box office news and ticket sales for weeks. 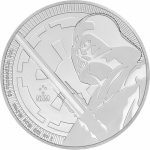 Additionally, the New Zealand Mint is producing a Star Wars Classic collection that features images of the characters from the original trilogy of Star Wars films. 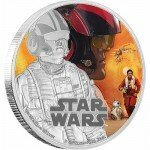 The Classic collection debuted with a Darth Vader release, and has subsequently seen the release of a Han Solo coin, Yoda coin, and R2-D2 coin. Throughout the course of human history there have been numerous classes of warriors that have defended their nations, brought enslavement upon others, and glorified the honor and sacrifice of military service. The Warriors of History colorized proof collection from the New Zealand Mint honors these battle-hardened warriors for their contributions, good and bad, to the course of human history. 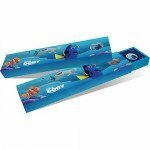 Ships to you in a themed display box and shipper, and features a Certificate of Authenticity. 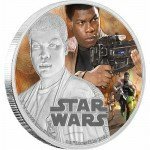 Maximum mintage set at just 10,000 coins for global distribution. Of course, the obverse of all Warriors of History coins from the New Zealand Mint feature the right-profile portrait of Queen Elizabeth II. The ruling monarch of Britain since 1952, Queen Elizabeth II is now the longest reigning monarch of the nation, surpassing the reign of her own grandmother Queen Victoria. Samurai Coin: Samurai were a caste of warriors in medieval and early-modern Japan. The first identification of this term came in the Kokin Wakashu, a series of imperial anthology of poems collected between 905 and 914. The term samurai was derived from the Chinese character that mean “to wait upon,” and originally translated to Japanese as saburau. 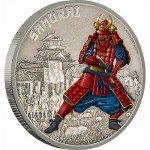 On the reverse of the 2016 1 oz Silver Niue Warriors of History Samurai Coin you’ll find the image of a Samurai warrior in his traditional armor. Samurai were known to wear full armor, including shields over their faces with frightening imagery. Viking Coin: Few warriors struck fear in the hearts of early Europeans in the manner the Vikings did. From mainland Europe to Russia and across the North Atlantic to the British Isles, Viking raiders would strike without warning from their longboats, rushing ashore and unleashing fury on unsuspecting civilizations. 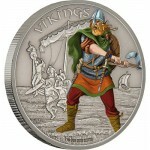 On the reverse of the Warriors of History Vikings Silver Coin you’ll find the colorized image a Viking warrior wielding his ax in the foreground, while a longboat in the background makes its way ashore to unload more Viking warriors. 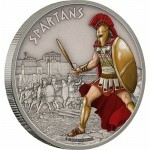 Spartan Coin: Spartan warriors trained from a very young age. The Spartan Empire used slaves for all of its manual labor, which freed up all of the men of Sparta to begin their training from a very young age. These men were noted for their physical strength and ability to defeat almost any foe, as highlighted by the feats of 300 men at the Battle of Thermopylae when just 300 Spartans took on the massive Persian Army. 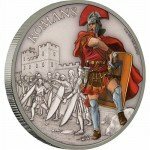 On the reverse of each Warriors of History Spartan Coin you’ll find the image of a Spartan warrior in the foreground, captured in full color with his red cape, body armor, shield, helmet, and sword. In the background a group of Spartan warriors can be seen lining up for battle. 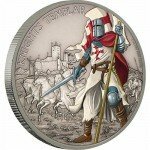 Knights Templar Coin: The Knights Templar were first established during the Crusades to protect Christian pilgrims as they traveled to the Holy Land, keeping them safe from the turmoil that engulfed the region at that time. The Knights wore distinctive uniforms consisting of a white tunic with a blood-red eight-pointed cross on the front. Each member of the Knights Templar had sworn to die for their faith. On the reverse of the Knights Templar Coin you’ll find the image of soldier from the Templar Order. His full-color uniform is brilliantly visible, and set against the antique-finished background that depicts the Knights Templar as they ride their warhorses into battle. 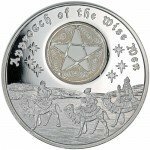 Approach of the Wise Men: This collection includes a 5-Pointed Wise Men Star coin and a 6-Pointed Wise Men Star coin. 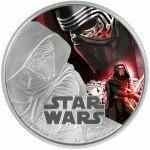 Both coins have a limited mintage of only 1,500 coins, contain 1 Troy oz of .999 pure silver, and bear face values of $2 (NZD). The design on each is the same, both obverse and reverse. 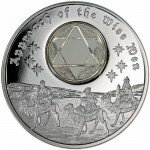 On the reverse side of each coin you’ll find the image of three travelers on camelback as they ride across the open desert toward the town of Bethlehem. These men are guided by the stars in the sky above, and there is either a five-pointed star engraved in the upper-central region of the design field or a six-pointed star. The obverse side of these Approach of the Wise Men coins includes the right-profile portrait of Queen Elizabeth II created in 1998 by Ian Rank-Broadley. Along with engravings of the face value, year of issue, and nation of issue on the coins, you’ll also find either the five-pointed or six-pointed star on this side. Gold Rushes of the World – California: Again, these coins are available in two different finishes. There is an antique coin in BU condition or a standard proof product to choose from. The antique BU coin has a limited mintage of 5,000 coins, while the standard proof is capped at 1,500 coins. Each includes a center capsule with a flake of 24-karat gold. When the California Gold Rush struck, the demographics of what was once known simply as the California Republic changed forever. Americans started flooding from the Midwest and Eastern seaboard to California. People were so enticed by the prospect of instant wealth that they made the treacherous trip by land and sea, some going down around the southern tip of South America via boat just to reach the Pacific Coast of North America. 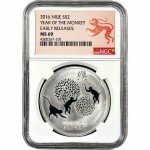 Endangered Species of the World: In an exclusive partnership with the Discovery Channel, the first release in a set of Endangered Species of the World coins has arrived and it focuses on two of Africa’s most at-risk species. 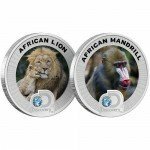 The continent’s beloved African Lion and the African Mandrill debut in the first two coin designs of this brilliant colorized series. On the reverse face of the 1.5 oz Silver Niue African Lion coin in this release is the colorized image of a male African lion as a young cub cuddles up to its face, though the attentive male keeps his eyes fixed in the distance. The reverse of the 1.5 oz Silver Niue African Mandrill coin also captures its representative mammal in full color. The mandrill is known to exhibit some of the greatest colors of any wild animal species, and is noted in particular for its red beard. Each coin’s obverse features a colorized image of the globe, with Queen Elizabeth II’s right-profile portrait included. While the latter series mentioned above is a product of the New Zealand Mint, the Gold Rushes of the World and Wise Men collection are not from the NZ Mint. 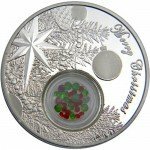 Both of those are a product of Coin Jewels, which is located in Torrance, California, and specializes in producing a variety of silver and gold products that range from numismatic coins to medals and casino tokens/chips. This is the longest running coin program representing the nation of Niue, although it did not originate as a coin series for this particular South Pacific Ocean nation. 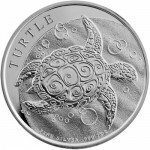 The short history of the Niue Hawksbill Turtle coin is an interesting one, and quite uncommon in the precious metals industry. The coins were first introduced in 2010 as the Silver Fiji Taku. The coins were struck from 2010 until 2013 as a bullion product issued for the independent island nation of Fiji. The face value was considered legal tender in Fiji, and featured the image of the hawksbill turtle on the reverse. The obverse side of the 2010, 2011, and 2012 Silver Fiji Taku coins featured the right-profile image of Queen Elizabeth II of England. The nation’s longest-reigning monarch is commonly portrayed on coins throughout the commonwealth, and was a natural selection for the obverse design of the original coins. However, in 2013 the New Zealand Mint opted for a new design on the obverse. This new design featured the official coat of arms for Fiji, which depicted the cultural roots of the island’s Polynesian people. Engravings on this side were scant, including the year of issue and the nation of issue in addition to the crest. 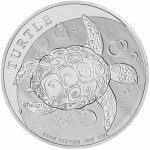 Beginning in 2014, there was a shift in the production of the Silver Fiji Taku coin. Due to political differences in the region, the Silver Fiji Taku was no longer designed and issued for that nation. 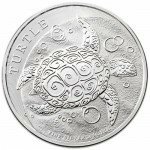 It was rebranded as the New Zealand Hawksbill coin and issued for the self-governing island of Niue. The small island, although self-governing, has very close ties with New Zealand. What makes this move intriguing is the fact that the design was largely unchanged for the reverse image. The hawksbill turtle was used in the exact same design theme, with a slight change to the inscriptions on this face. 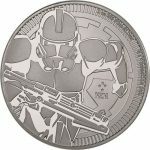 “Fiji Taku” was no longer engraved in the sliver of deeply-mirrored space on the coin. Instead, the word “Turtle” was engraved there. On the obverse, the right-profile portrait of Queen Elizabeth II returned to the coin. This time, it was the 1998 depiction created by Ian Rank-Broadley. 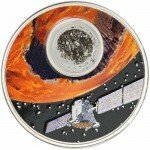 This particular image is immensely popular, and is used on coins from the Royal Mint in London as well as the Perth Mint in Australia. The nation of issue, face value, Her Majesty’s name, and the year of issue are all included on this face. On certain occasions the New Zealand Mint will now produce the New Zealand Hawksbill coin in heavier weights beyond the standard 1 oz coin. 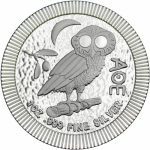 Although the 5 oz weight is the most common larger size, the mint has also created and released 2 oz and 10 oz options, though mintage was restricted. When you purchase Silver Niue Coins on Silver.com, you’ll find a number of payment methods available to complete your transaction. We accept Visa and MasterCard credit and debit cards, as well as paper checks, Pay Pal transfers, and bank wire transfers. Credit and debit cards have a maximum purchase of $5,000 and generally take one business day to process. 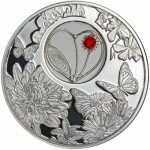 If you have any further questions about Silver Niue Coins, please don’t hesitate to ask Silver.com. Our associates are available on the phone at 888-989-7223, or you can connect with us online using our live web chat and email features. 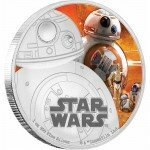 And be sure to check back with Silver.com as future releases of Silver Disney Coins from the New Zealand Mint and others!